One conclusion only from things like this: they make it up as they go along. And then you can cite ‘experts’ all you want, but experts in what? Uncharted territory? That doesn’t make any sense. Once the Federal Reserve lifts interest rates from near zero, likely this week, the focus will turn to the other legacy of the crisis-era policies: the Fed’s swollen balance sheet. The prevailing view is that the U.S. central bank’s $4.5 trillion portfolio, vastly expanded by bond purchases aimed at stimulating the economy, will have to shrink once rates are on their way up, and the Fed will just need to decide how quickly. Now, however, there is a new twist to the debate, with some policymakers and outside experts saying that there are reasons to keep the balance sheet big. Arguments in favor of a leaner pre-crisis era Fed portfolio have been well laid out. A smaller balance sheet would mark a return to “normal” policy, minimize the Fed’s impact on the allocation of credit across the economy, and help defuse political pressure from critics accusing the Fed of overextending its influence beyond its core monetary mandate. As recently as September 2014, the Fed pledged to eventually “hold no more securities than necessary,” in its “normalization” plan, a level widely interpreted as close to its pre-crisis $900 billion size. Today as the long-anticipated rate lift-off draws close, the central bank appears to be warming to the idea of a sizeable balance sheet. A “permanently higher balance sheet … is something that we haven’t studied that much but I think needs a lot more thought,” John Williams, president of the San Francisco Fed, said last month. A big Fed portfolio could help stabilize financial markets by inducing banks to keep greater amounts of money in reserve, advocates say. It could also give the Fed a permanent policy tool with which to target sectors of the economy and certain parts of the bond market. For example, the Fed could buy and sell certain assets to stimulate or cool the mortgage market or to affect longer-term borrowing costs, says Benjamin Friedman, former chairman of Harvard University’s economics department. Experts addressing a conference hosted by the Fed last month, said the central bank Fed could use the assets as a new “macro prudential” tool to deal with financial market bubbles – by cooling particular sectors with targeted asset trades – and ward off investor runs by letting ample bank reserves act as a buffer. And while the Fed is now replenishing its portfolio as bonds mature and plans to continue doing so for another year or so, policymakers have directed staff to examine alternatives and to consult outside experts, according to minutes of the Fed’s July meeting. It’s hard to know how bad the latest turmoil in the market for risky corporate debt will become. Already, though, it offers some insight into what’s good – and what could be better – about the so-called shadow banking system. Over several years following the 2008 recession, in an effort to reap better returns amid extremely low interest rates, investors piled into higher-yielding debt issued by companies with relatively shaky finances. This is a classic example of shadow banking: People put their savings into various types of funds, which in turn provided hundreds of billions of dollars in financing to companies, largely bypassing traditional banks. Now, inevitably, the cycle is turning. Investors are fleeing from funds that focus on high-yield bonds, precipitating sharp price declines and presenting portfolio managers with the difficult task of finding buyers for securities that rarely trade. As a result, some mutual funds, including one run by Third Avenue Management, have frozen withdrawals as they raise the necessary cash. Others may follow. So what does this tell us? For one, it suggests that shadow banking can play an important role in making the financial system more resilient. Unpleasant as Third Avenue’s troubles may be for its investors, the broader repercussions are limited. That’s in part because mutual funds can’t use nearly as much borrowed money, or leverage, as banks typically do. As a result, the funds are very unlikely to end up owing more than their assets are worth – a disastrous outcome that, if it happened at a large institution or at many smaller ones, could destabilize the entire financial system and necessitate taxpayer bailouts. That said, mutual funds aren’t alone in holding risky corporate debt. Large quantities of loans and bonds, as well as derivative contracts linked to them, reside in various other nonbank institutions – such as hedge funds – that can be highly leveraged and also active in other markets, making them potential conduits for contagion. Regulators have a hard time knowing where the risks are concentrated in this truly shadowy realm, in large part because their areas of responsibility are fragmented and they lack incentives to share information. One obvious solution, in which Congress has unfortunately taken no interest, would be to give the Financial Stability Oversight Council more power to shed light on dark corners and more authority to mitigate emerging risks. Beyond that, regulators should make use of tools – such as limits on the amount of money that can be borrowed against securities – that reduce the likelihood of distress among all financial-market participants, no matter what form they take. Keep rates low, and you get this. Wall Street is having a 2007 flashback as a high-yield debt rout triggers nightmares of hard-to-trade assets plunging in value and funds halting redemptions. 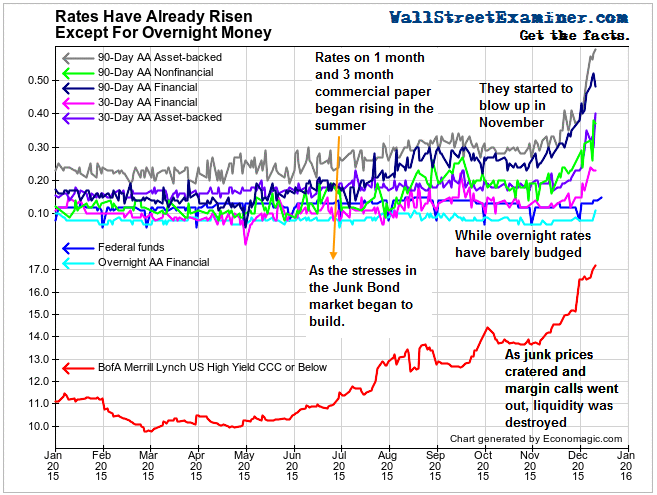 Jim Reid, a strategist at Deutsche Bank, wrote Monday that this month’s turmoil, including Third Avenue Management’s suspension of cash redemptions from a mutual fund that invested in high-yield debt, may be a harbinger of things to come. Berwyn Income Fund’s George Cipolloni said the similarities between markets now and those before the financial crisis are too big to ignore. Get a grip, traders and analysts say: This isn’t the making of another financial crisis – at least not yet. “I don’t see any systemic risks out of this,” said Fred Cannon, a KBW Inc. bank analyst, likening the current situation more to the popping of the Internet bubble than to the credit crunch that crippled the financial system. The number of junk-debt funds that promise investors quick access to their money has exploded since September 2008 as zero interest rates spurred demand for higher returns. There are now 35 U.S.-based high-yield exchange-traded funds with $43 billion under management, compared with three funds with $1.3 billion in 2008, according to data compiled by Bloomberg. The number of mutual funds has grown to 252 from 100 in 2008 and assets increased to $326 billion from $126 billion. After several months of significant reserves liquidations by China (specifically by its Euroclear proxy “Belgium”) which tracked the drop in China’s reserves practically tick for tick, in October Chinese+Belgian holdings were virtually unchanged according to the latest TIC data, as China moderated its defense of its sliding currency. Of course, putting this in context still shows a China which has sold $600 billion of US paper since 2014, as this website was first to note over half a year ago. And while we expect a prompt resumption of Treasury selling in the coming months following China’s recent aggressive devaluation of its currency, what was more notable in today’s TIC data was the consolidated total change of all foreign US Treasury holdings. As shown in the chart below, following an increase of $17.4 billion in September, foreign net sales of Treasuries hit an all time high of $55.2 billion, surpassing the previous record of $55.0 billion set in January. In absolute terms, October’s total foreign holdings by major holders declined to $6,046.3 trillion the lowest since the summer of 2014. What is the reason? There are two possible explanations, the first being that foreigners are unloading US paper (ostensibly to domestic accounts) ahead of what they perceive an imminent Fed rate hike which would pressure prices lower, or more likely, the ongoing surge in the dollar and collapse in commodity prices continues to pressures foreign reserve managers to liquidate US Treasury holdings as they scramble to satisfy surging dollar demand domestically and unable to obtain this much needed USD-denominated funding, are selling what US assets they have. Should this selling continue or accelerate in the coming months and if it has an adverse impact on TSY yields, it may also force the Fed’s tightening hand if, as some expect, the liquidation of foreign reserves becomes a self-fulfilling prophecy and leads to a material drop in Treasury prices. Fast money, shadow banking, call it what you want. The cash that finances the U.S. economy is now coming from a spigot that is more prone to rapidly turning off in times of stress than the traditional banking system has been, according to the strategist who first brought attention to banks misstating key benchmark lending rates during the financial crisis in 2008. The warning from Scott Peng, head of global portfolio solutions at Secor Asset Management in New York, comes as investors, analysts, and regulators fret about the recent selloff in the corporate bond market, which the strategist includes in his definition of the so-called “shadow banking system” of nonbank financial intermediaries. Such shadow banking includes all private-sector funding that isn’t provided by deposit-taking banks, so it encompasses bond funds as well as hedge funds, insurance companies, and pension funds, according to Peng. While rules imposed in the wake of the financial crisis have shored up the banking system, he argues that regulators have swapped one set of systemic risks for another. World Bank data show that the percentage of U.S. private-sector funding provided by banks has fallen to almost the lowest point since 1960, illustrating the growing importance of nonbank financing. “Since 2008, we’ve reformed the banking system by ring-fencing our banks with more regulatory and capital requirements,” Peng told us. “But our economy is now much more dependent on the fast-money shadow-bank financing—which is more fickle in terms of extending credit and can expand or contract much quicker.” Peng was among the first during the financial crisis to suggest that the London interbank offered rate, known as Libor, was understating borrowing costs. As the then-head of U.S. interest rate strategy at Citigroup Global Markets in New York, Peng co-authored a note titled “Is Libor Broken?” in April 2008. The report, which led to a global focus on the risk that the benchmark was mispricing bank lending rates, said European banks were probably submitting lower-than-actual transacted rates to avoid “being perceived as a weak hand in a fragile market.” Peng predicts that the share of private financing coming from banks at the end of this year will hold close to the 20.6% level of December 2014, given that flows into bond funds have remained positive and bank lending hasn’t risen materially. Gross issuance of investment-grade U.S. dollar-denominated corporate bonds reached $1.23 trillion through Nov. 20, up from $1.15 trillion in all of 2014, marking a fourth successive year of record sales. In the second quarter of this year, assets in hedge funds reached a record $2.97 trillion before slipping to $2.9 trillion, according to HFR. All birds of the one same feather. Credit Suisse is the main protagonist. Last week, Third Avenue Focused Credit Fund suspended investor redemptions, and credit markets reacted violently. This was the first time mutual fund investors were similarly gated since the financial crisis of 2008. However, the $788.5 million Third Avenue fund might be the tip of the iceberg. According to data obtained by Yahoo Finance*, there are currently $27.2 billion in mutual fund assets that have suffered peak-to-valley losses over the last year greater than 10%. This amount is 35 times greater than the size of the Third Avenue fund, which suffered the third worse loss in the list of -34.5%. The two greatest losses bear a common name, which dominates the list: Credit Suisse. Total assets of $15.9 billion are represented by Credit Suisse named funds, or 59% of the $27.2 billion total. The largest fund in the list is Credit Suisse Institutional International, which has total assets of $9.9 billion. According to Morningstar, it is currently managed by American Funds. When the time period of the analysis is extended to the peak of June 19, 2014, fund performance for the Credit Suisse named fund reflects a loss of -24.6%, which is roughly half of the -47.4% loss of the Third Avenue fund. Today, the Federal Open Market Committee commences a two day meeting and is widely expected to announce on Wednesday an interest rate increase of 25 basis points for its benchmark Federal Funds rate. Further rate hikes may exacerbate problems in the credit markets, as companies that rely on high yield financing would face difficulty obtaining new loans and rolling over existing loans. Contagion in risk markets might be contained, according to Goldman Sachs. In a report dated December 11, Goldman said credit markets are simply sending a “false recession signal” similar to the events that unfolded in 2011. Nevertheless, the trend of withdrawals in the mutual fund sector continues. According to the latest data from Lipper, U.S. based stock funds suffered $8.6 billion in net outflows over the week ending December 9, which is the worst reading in four months. As assets are shifted around into year end, the trend is likely to continue. All oil crashes aren’t equal. This week West Texas Intermediate prices dipped below $35 a barrel, the lowest they’ve been since the 2008 financial crisis – from which oil prices have yet to fully recover. Previous oil crashes resulted from economic crises that temporarily blunted demand. This time, robust energy reserves created by the shale gas and oil revolution in the U.S. have put OPEC on the defensive. Shale reserves appear plentiful and are cheap to produce, forcing OPEC’s de-facto leader, Saudi Arabia, to focus on maximizing its own oil output. With Congress open to lifting the export ban, the oil market could also be awash in unfettered U.S. crude exports. Commercial crude stockpiles were at 485.9 million barrels through Dec. 4, more than 120 million barrels above the five-year seasonal average. Excess oil inventories may be with us through 2016, according to my Gadfly colleague Liam Denning – and may not truly normalize until 2017. As you can see from the chart, the current crash in oil prices isn’t quite as deep as in 1985 or 2008 (the ’08 plunge was saw prices tank 77% in just over 100 trading days). The current crash is also not yet as lengthy as the less severe 1997 plunge, which took nearly 500 trading days to reach bottom and only about 200 trading days to return to its previous peak (following the Asian financial crisis). What is distinct about the current price plunge is that it’s unclear whether a robust price recovery will even arrive again – and if it does how it might align with previous rebounds. Central bank inflation targets are magic tricks meant to deceive. The oil market doesn’t seem to care about Mario Draghi’s inflation target. Less than two weeks after the European Central Bank president unveiled a beefed-up stimulus program to push inflation back toward its 2% target, fresh falls in the price of crude may have already undermined his efforts. Analysts at Nomura and JPMorgan say Draghi’s December forecast of 1% average inflation in 2016 may be too ambitious. Charles St-Arnaud and Sam Bonney at Nomura have found that the 25% slump in the WTI oil benchmark since the end of October may already be casting its shadow over inflation next year. They’ve calculated the so-called base effects – the contribution of outsized price swings in one year to the following year’s annual inflation rate – that they see as likely to have an impact in 2016. The oil-price drop we’ve just seen may halve the base effect in some months next year, they write. And that could keep a tight lid on gains in the headline inflation rate, now just at 0.1%. “A weaker base effect early next year means that headline inflation should remain lower than we estimated only a couple of weeks ago,” the analysts say in a note to clients. “Whereas before we saw eurozone inflation reaching 1% in early 2016, the weaker oil prices could mean that headline inflation only reaches 0.5% to 0.6%.” In its December round of staff forecasts, the ECB staff based their prediction of 1% inflation in 2016 and 1.6% in 2017 on an average price for Brent of $52.2 and $57.5, respectively. However, Brent is now below $40 a barrel. If that’s maintained, euro-area inflation won’t meet the 1% average forecast, writes JPMorgan’s Raphael Brun-Aguerre. And if it falls to $20, the euro-area would be in outright deflation, his projections show. Ambrose is trying to convince us that demand is rising fast. OPEC will be forced to call an emergency meeting within weeks to stabilize the market if crude prices fail to rebound after crashing to seven-year lows of $35 a barrel, two of the oil cartel’s member states have warned. Emmanuel Kachikwu, Nigeria’s oil minister and OPEC president until last week, said the group is still hoping that the market will recover by February as low prices squeeze out excess production from US shale, Russia and the North Sea, but nerves are beginning to fray. “If it [the oil price] doesn’t [recover], then obviously we’re in for a very urgent meeting,” he said. Indonesia has issued similar warnings over recent days, suggesting that the OPEC majority may try to force a meeting if Saudi Arabia’s strategy of flooding the market pushes everybody into deeper crisis. The comments came as Brent crude plunged to $36.76 as the fall-out from OPEC’s deeply-divided meeting earlier this month continued. Prices are now within a whisker of their Lehman-crisis lows in 2008. West Texas crude dropped to $34.54 before rebounding in late trading. Lower quality oil is already selling below $30 on global markets. Basra heavy crude from Iraq is quoted at $26 in Asia, and poor grades from Western Canada fetch as little as $22. Iran’s high-sulphur Foroozan is selling at $31. The oil market is now in the grip of speculative forces as hedge funds take out record short positions and exchange-traded funds (ETFs) liquidate paper holdings, making it extremely hard to read the underlying conditions. Russian finance minister Anton Siluanov said his country is bracing for the worst. “There is no defined policy by the OPEC countries: it is everyone for himself, all trying to recapture markets, and it leads to the dumping that is going on,” he said. “Everything points to low oil prices next year, and it’s possible that it could be $30 a barrel, and maybe less. If someone had told us a year ago that oil was going to be under $40, everyone would’ve laughed. You have to prepare for difficult times.” The rouble fell to 71 against the dollar, helping to cushion the blow for the Kremlin’s budget but also further eroding Russian living standards. Elvira Nabiulina, the head of Russia’s central bank, said the authorities are now preparing for an average price of $35 next year, a drastic cut even from the earlier emergency planning. Bank of America says OPEC is effectively suspended as Saudi Arabia wages a price war within the cartel against Iran, its bitter rival for geo-strategic dominance in the Middle East. This duel is complicated yet further by a parallel fight with Russia outside the bloc. Mike Wittner, from Societe Generale, said the Saudis’ motive for floating a proposal at the OPEC summit for a 1m barrel per day (b/d) output cut if Russia, Iraq and others agreed to join in was tactical, chiefly in order to demonstrate to critics at home that no such deal could be forged. He said the strategy to flood the market was not taken lightly and has support from the “highest possible level”. Part of the goal is to discourage energy efficiency and deter investment in renewables. OPEC is not due to meet again until June 2016 but by then a string of its own members could be facing serious fiscal crises. Even Saudi Arabia is freezing public procurement and drawing up austerity plans to rein in a budget deficit near 20pc of GDP. The kind of thing you shouldn’t have to say. Like when an owner of sports team goes public saying he ‘supports’ the coach. Never a good sign. The government has “full confidence” in the Bank of Italy and market regulator Consob, he said. Italian authorities came under fire after it emerged that many ordinary Italians had been sold risky subordinated bonds that, in case of bankruptcy, only get repaid after ordinary creditors have been reimbursed in full. Around 10,000 clients of the four banks held some €329 million in such junior bonds, the Treasury said on Monday. Padoan said he did not know if the government would be weakened by the affair which has hit bank bonds and shares. Retail investors have rushed to sell junior bank bonds after one pensioner who lost his savings committed suicide. Padoan gave his support to the Minister for Reforms Maria Elena Boschi, one of Italian Prime Minister Matteo Renzi’s closest allies, who faces a no-confidence motion in parliament tabled by the anti-establishment 5-Star Movement, over an alleged conflict of interests. Boschi’s father was vice-president of Banca Etruria (PEL.MI) until the bank was put under special administration by the Bank of Italy this year and Boschi herself was a shareholder. “I am sure that Boschi will come out of this extremely well,” Padoan said. The political backlash for Renzi is particularly damaging because the four rescued banks mainly operate in central Italian regions that are traditional strongholds of his center-left Democratic Party. Thumbscrews. Why not just get Germans to run it openly? Greece’s four main banks will have to reduce their employees by a total of 4,350 and shut down about 180 branches between them up to the end of 2017. These new reduction demands result from the derailing of the Greek economy generated by the prolonged uncertainty during 2015 which brought the country to the brink of exiting the eurozone. The job cut and the branch shutdown will have been included in the revised restructuring plans that National, Alpha, Piraeus and Eurobank have submitted to the European Commission’s competition authorities which were required after the four lenders underwent their latest recapitalization process. The new wave of cuts comes on the back of the Greek banking sector’s major contraction over the last few years. According to data compiled by the Hellenic Bank Association, in 2009 Greece boasted 19 domestic banks, 36 foreign ones (mainly branches of major international lenders) and 16 cooperative banks. Nowadays there are just seven banks remaining (the four systemic ones plus Attica Bank, HSBC and Panellinia) and only five foreign banks with branches in Greece, and it seems like only three cooperative banks will survive, if they manage to collect the funds required for their recapitalization. Hillary Clinton has a knack for saying what she believes she needs to. But when it comes to fortitude and detail, actions speak louder than rhetoric — including the rhetoric she espoused Monday at the New School to describe her self-defined pro-growth, pro-fairness economic blueprint. Over many years, via her actions and omissions in positions of high public responsibility, Clinton has failed to demonstrate an interest in reforming the power structures that fortify themselves at the expense of America’s middle class. In pursuit of the presidency, Hillary is crafting her message to capture the attention of the center as well as the progressives. Yet by doing so, it all feels scripted and safe, straining the boundaries of credulity. [..] Hillary Clinton came to New York City to make her case on fighting inequality and spurring growth. Yet when she speaks about inequality, she’s either ignoring or unaware of the bigger picture. The very power structure of Wall Street has become more concentrated and thus presents a greater risk to stability than ever before due to a series of deregulatory moves and bailouts under Presidents from both sides of the aisle. Yes, several of Hillary’s checklist items are useful to “ordinary Americans.” Raising the minimum wage, trying to gain salary parity for both genders and “putting families first” with paid sick leave and widely available free pre-kindergarten are all noteworthy policy agendas. They become less meaningful when dropped with such little detail by someone who has been in politics for so long. By how much should we raise minimum wages? How do we get parity? What does it mean to put families first if corporate boards vote their chairs massive compensation packages, regardless of whether the firm invests in R&D or employees? Will we put CEOs in jail for presiding over felonious firms or tacitly support their eight-figure bonuses and incarcerate bankers that aren’t her friends down the totem pole as she suggests? Further, what does it mean to reduce Wall Street risk when the Big Six banks collectively control 42% more deposits, 84% more assets and are hoarding 400% more cash then they were prior to the financial crisis, and when just 10 big banks control 97% of bank trading assets? Bold, fresh ideas that shake up the core of the American power concentration structure did not come from Hillary Clinton. Nor will they come from Jeb Bush or other Republican frontrunners. The only way to articulate policies that can work for America as a whole is to re-imagine America as a country of equal opportunity for all — and that means limiting the concentration of power of the few that, by virtue of donations, lobbying forces and elite alliances, dictates policies that reinforce their dominance. The Poor Law reformers of the 1830s believed that hard work is a virtue in and of itself, regardless of usefulness to society or financial benefit to those doing it: the workless are “moral defectives” who must be forced to work in order to correct the defects in their personalities. Thomas Malthus believed that public spending that supports the poor encourages them to breed: the poor must be condemned to a life of poverty and deprivation to discourage them from choosing to have children at state expense. The children of workless parents must be protected from their malign influence. The Mother’s lament resonates with all too many of today’s mothers: How shall I feed my children on so small a wage? How can I comfort them when I am dead? This is the creed of meanness and selfishness, lampooned by Dickens in “A Christmas Carol”. It is the creed of the false gods of Hard Work and Saving. But we, cocooned by the belief that we are better than our ancestors, invoke these false gods and publish the creed anew. The morality of the workhouse has become the morality of the Daily Mail. In bringing back the “old religion”, we have set the poor and vulnerable against each other. Solidarity disintegrates; the poor fight each other for a share of a pot of money that is deliberately kept too small to meet all needs, and demand that others who might need a share too are kept out. “Close the borders”. “Stop immigration NOW”. “We can’t afford refugees”. These are the cries of those who fear that the arrival of others will mean that they lose even more. In Europe, the same harshness is evident, but on an even larger scale. Worshipping the false gods of hard work and saving comes at a terrible price. The sacrifices those gods demand are the lives of those who do not – or cannot – live as they dictate. But as yet, there is no widespread challenge to their authority. People still believe the lie they tell: “There is no more money”. People used to believe the promise of the gods of borrowing and spending, “The money will never run out”. But their belief was shattered in the crash of 2008, when the debt edifice abruptly collapsed, causing widespread financial destruction. People not only stopped believing that promise, they also stopped believing in themselves. The terrible recession and ensuing long slump created an enormous confidence gap. Into this gaping hole stepped the old gods and their new lie. Here goes controversy. Keep in mind: don’t shoot the messenger! Advocates of vegetarianism – including everybody’s favourite Governator – regularly point out how how harmful human consumption of meat is to the environment, but is opting for a fully vegetable-based, meat-free diet a viable way to cut down on energy use and greenhouse gas emissions? Nope – according to a new study by scientists in the US – or, at least, it’s not that simple. Researchers at Carnegie Mellon University (CMU) say that adopting the US Department of Agriculture’s (USDA) current recommendations that people incorporate more fruits, vegetables, dairy and seafood in their diet would actually be worse for the environment than what Americans currently eat. “Eating lettuce is over three times worse in greenhouse gas emissions than eating bacon,” said Paul Fischbeck, one of the researchers. “Lots of common vegetables require more resources per calorie than you would think. Eggplant, celery and cucumbers look particularly bad when compared to pork or chicken.” If these findings seem surprising in light of what we know about the impact of meat on the environment, you’re probably not alone. You’re also not wrong – meat production does take a high toll on the environment. But what we need to bear in mind is that the energy content of meat is also high, especially when compared to the energy content of many vegetables, which is why going on a salad diet is great for your waistline. Consuming less energy content means less you in the long run. But what if you don’t want to lose weight? What if you just want to replace the same amount of energy you get from meat with energy from vegetables? Well, then, to put it very simply, you need to eat a lot of vegetables. And when you contrast meat and vegetables on their impact per calorie as opposed to by weight, veggies suddenly don’t look quite so environmentally friendly. [..] The researchers acknowledge that their findings may be somewhat surprising in light of the zeitgeist over meat’s impact. “These perhaps counterintuitive results are primarily due to USDA recommendations for greater caloric intake of fruits, vegetables, dairy, and fish/seafood, which have relatively high resource use and emissions per calorie,” they write in Environment Systems & Decisions. But controversial as the findings may sound, comparing the respective impact of different foods based on their calorie content isn’t new or radical. No-one’s listening. Flapping butterfly wings and all that. While 76% of species are declining, prospects for a handful of the most endangered butterflies in Britain have at least brightened over the past decade, according to the study by Butterfly Conservation and the Centre for Ecology & Hydrology, with rare species responding to intensive conservation efforts. During the last 10 years, the population of the threatened Duke of Burgundy has increased by 67% and the pearl-bordered fritillary has experienced a 45% rise in abundance as meadows and woodlands are specifically managed to help these species. Numbers of the UK’s most endangered butterfly, the high brown fritillary, are finally increasing at some of its remaining sites in Exmoor and south Wales, showing the success of targeted conservation efforts there. But The State of the UK’s Butterflies 2015 report cautions that such revivals still leave these vulnerable species far scarcer than they once were – the high brown fritillary has suffered a 96% decline in occurrence (meaning the sites at which it is present) since 1976, reflecting its disappearance from most of Britain. Other endangered butterflies, including the wood white (down 88% in abundance), white admiral (down 59% in abundance) and marsh fritillary have continued a relentless long-term decline. The Arctic experienced record air temperatures and a new low in peak ice extent during 2015, with scientists warning that climate change is having “profound effects” on the entire marine ecosystem and the indigenous communities that rely upon it. The latest National Oceanic and Atmospheric Administration (Noaa) report card on the state of the Arctic revealed the annual average air temperature was 1.3C (2.3F) above the long-term average – the highest since modern records began in 1900. In some parts of the icy region, the temperature exceeded 3C (5.4F) above the average, taken from 1981 to 2010. This record heat has been accompanied by diminishing ice. The Arctic Ocean reached its peak ice cover on 25 February – a full 15 days earlier than the long-term average and the lowest extent recorded since records began in 1979. The minimum ice cover, which occurred on 11 September, was the fourth smallest in area on record. More than 50% of Greenland’s huge ice sheet experienced melting in 2015, with 22 of the 45 widest and fastest-flowing glaciers shrinking in comparison to their 2014 extent. Not only is the ice winnowing away, it is becoming younger – Noaa’s analysis of satellite data shows that 70% of the ice pack in March was composed of first-year ice, with just 3% of the ice older than four years. This means the amount of new, thinner ice has doubled since the 1980s and is more vulnerable to melting. The report card – compiled by 72 scientists from 11 countries – noted sharp variations in conditions in the northern part of the Arctic compared to its southern portion. German interior minister just completely made that up. And he’s still in his job? The proportion of people entering Germany with fake Syrian passports is far less than the 30% announced by the interior minister in September, the government has said. Germany has to date maintained an open-door policy for Syrians escaping their country’s bloodshed, giving them “primary protection” – the highest status for refugees. Among other benefits, this status includes a three-year residence permit and family reunification. The policy has sparked controversy, heightened after the interior minister, Thomas de Maizière, said in September that up to 30% of people were found coming into Germany with false Syrian passports and actually came from other nations. He said the figures were based on estimates from people working on the ground. But in response to a question from the leftwing Die Linke party, the government said in a written note obtained by AFP late on Monday that only 8% of the 6,822 Syrian passports examined by authorities between January and October were actually found to be fake. Die Linke lawmaker Ulla Jelpke criticised the minister, saying: “Instead of looking into a crystal ball… the minister should lean towards facts and reality.” Germany is Europe’s top destination for refugees, most of whom travel through Turkey and the Balkans, and expects more than 1 million arrivals this year. Only 64 of the tens of thousands of refugees that Greece’s European Union partners should be taking to help lighten the country’s migrant burden have actually gone to other EU states. The EUs executive Commission also said on Tuesday that just one of the five “hotspot areas” on the Greek islands meant to register and fingerprint arriving migrants is operational. The hotspots are a key component of the EUs relocation plan to share 66,400 refugees in Greece with other EU nations over the next two years. The Commission noted that only nine of the 23 participating EU states have offered relocation places to Greece, almost three months after the scheme was launched. This topic contains 2 replies, has 3 voices, and was last updated by rapier 3 years, 4 months ago. The number of factors you have to account for, that cannot be accurate modeled or measured is staggering. Yet the slightest adjustment to any of 5 planet-sized calculations will lead to an error calculated in millimeters–over a timescale before anyone was measuring. If you like puzzles, here it is. From the Reuters story; “The prevailing view is that the U.S. central bank’s $4.5 trillion portfolio, vastly expanded by bond purchases aimed at stimulating the economy, will have to shrink once rates are on their way up,” has it backwards. In order to raise rates the Fed may well have to shrink its balance sheet. It might be able to effect the quarter point raise in the Fed Funds rate without it simply by their sacred words and the assistance of their partners the banking giants. The Fed will probably never sell out of its holdings. In all likelihood they will be adding to them soon enough. While everyone was obsessed with the possible Fed Funds rate hike, which by the way is barely used anymore since the banks have $2.5Tn in ‘excess’ reserves, other short term rates have been rising already. And then don’t forget the Brazils of the world or the frackers who simply can’t borrow anymore.